In leveraging DNA it helps to know how the stuff works. It’s remarkably simple yet generates every living thing around you. From a simple code nature has created effectively infinite combinations. It only takes 5 minutes to learn but you will gain a deep understanding of the process of life and be a hit at Genetic Meetups. DNA words consist of 3 letters. An example would be GCT or TAC. Resulting in 64 (4 * 4 * 4) combinations or unique words in DNA. In DNA terminology a word is a called a codon. DNA follows a simple pattern. G connects to C and T connects to A. Its always this way. If you know one side, you know the other, that’s why DNA can copy itself. A cell reads DNA much as you read a paragraph. ATG means start reading. TGA and TAG means stop reading. 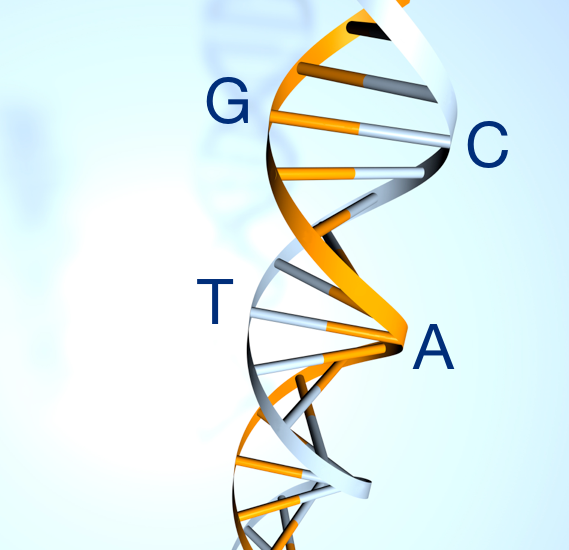 The DNA words in the middle are a called a gene – a DNA recipe to make something. Typically a gene consists of thousands of DNA words. A DNA recipe or gene will usually make a big molecule called a protein. The same protein you find on food labels. When you eat protein such as milk or sushi, your body will break the protein down into its parts and reassembles them into a new proteins based on the instructions in a gene. If your curious, those protein parts are known as amino acids. The DNA to protein process is the Central Dogma of Biology and is key to all life on earth. We know it works because your alive to read this. My friend Daniel Reda from Singularity University, who was also my business partner at CureTogether, did an excellent talk on this topic. As you can imagine, changes in DNA letters lead to changes in DNA words, leading to changes in DNA recipes. Much like replacing a potato with tomato, changes in DNA lead to wildly different proteins. In food it can be fun, in humans it is the source of many diseases, especially cancer. Thinking Exponentially, our rapidly growing ability to read DNA is key. 1) I am an Associate Founder of Singularity University.